I’ve become a little obsessed with observing this particular supernova remnant. I think it’s because it can show lots of nebulous goodness under less than perfect skies and with less aperture than some: it’s a realistic target. That said, it’s not straightforward with a light polluted sky, but mid-summer is the best time to try with Cygnus right overhead, and that’s what I do every year. I guess it’s obvious that I wasn’t blogging much in 2016, but I have been writing for my local astronomy society newsletter which has obviously drained my creative well… that’s my excuse anyway. I have be observing and probably more intensively than ever. Having posted a real article I thought I’d do a round up of my rough and ready observing statistics for 2016. If you haven’t seen 2015’s and feel you need some context then “Observing Patterns” is the place to go. How did 2016 stack up? I keep a diary in which I note the weather conditions at night, whether I got out there, and if not what stopped me. Summarised here is the number of observable nights – remember my loose definition – and the number I actually observed. Not unlike the one from 2015. 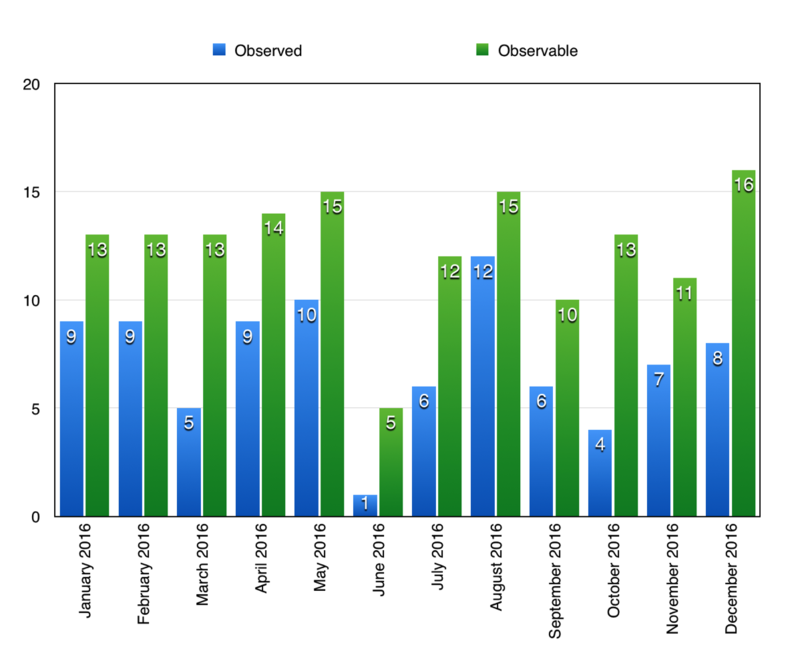 I averaged about 7 observing sessions per month last year too, and took advantage of 78% of opportunities presented. The stand out month has to be June with one single session. So how was the Solar? I think this chart tells the story very nicely. 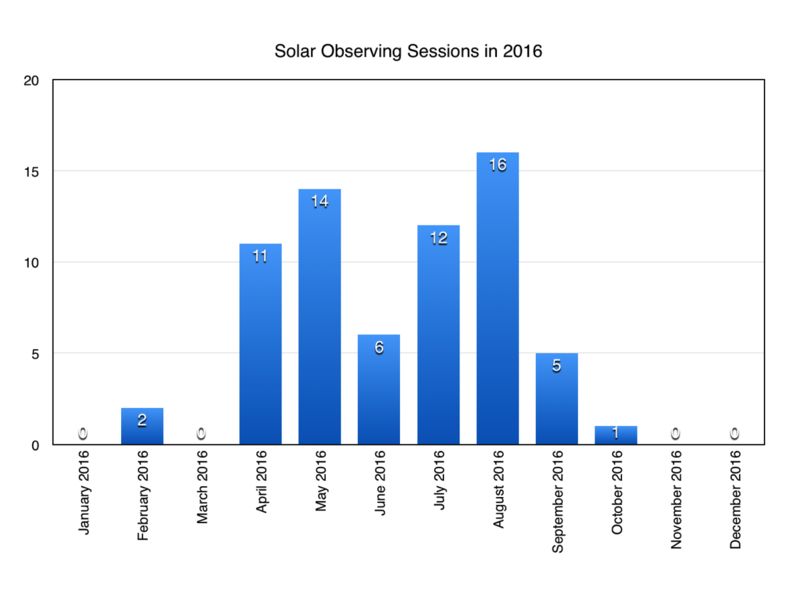 I did a lot more Solar work in 2016 than in the previous year: 2016 had 67 sessions, whilst 2015 saw only 28. I also stretched the solar season a little too. These are both white light, which increased, and hydrogen alpha observing sessions. I’m pretty happy with my solar progress last year and hope for more of the same. It’s been great fun. Was 2016 what I expected? For once I think things turned out much as I’d hoped… which can’t be said for many other aspects of 2016. I’ve completed some solar sketching of both white light and hydrogen alpha features. I plan to carry on in much the same vein this year. 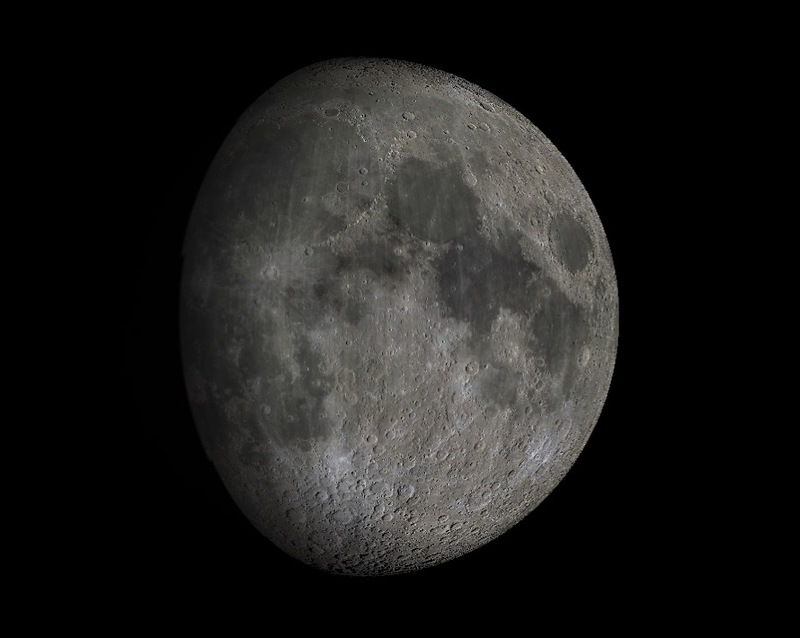 I concentrated on learning my lunar geography and geology over the last year, the result of which is that I’ve spotted some regions of particular interest for close study this year. I revitalised my variable star observing towards the end of last year as I targeted 1000 submitted observations. I’m becoming even more stellar obsessed, so much more variable and double star action to come in 2017. I’ve advanced my deep-sky observing skills whilst furthering my binocular census of the Messier objects, starting the Herschel 400 with small scopes and getting better observations of the Veil nebula using an even smaller scope (another story). On a sad note, I soaked up the last of the planetary goodness for a while, observing Jupiter whenever it was visible. The gas giants are sinking way too low for me for the next few years. So despite recently observing the last of the major planets to escape me – Neptune – and last year spotting Titan in the C90, planetary observing isn’t likely to feature in 2017. It was the 8th January 2017. The morning had been lovely with sunshine in place of the predicted fog! It didn’t last. As the afternoon wore on the clouds gathered and by nightfall not only covered the sky but had delivered a persistent drizzle. So I didn’t expect much when I stuck my head out of the back door at around 22:20 UT. The first thing that struck me was how warm (6°C) it felt despite being dressed in a T-shirt and lightweight fleece pullover. Then I noticed how damp it felt: our local humidity was nearing 100% it seems. Not expecting much I looked up to the south west and I noticed something bright. The Moon was punching through the rapidly moving clouds well enough to be quite observable!